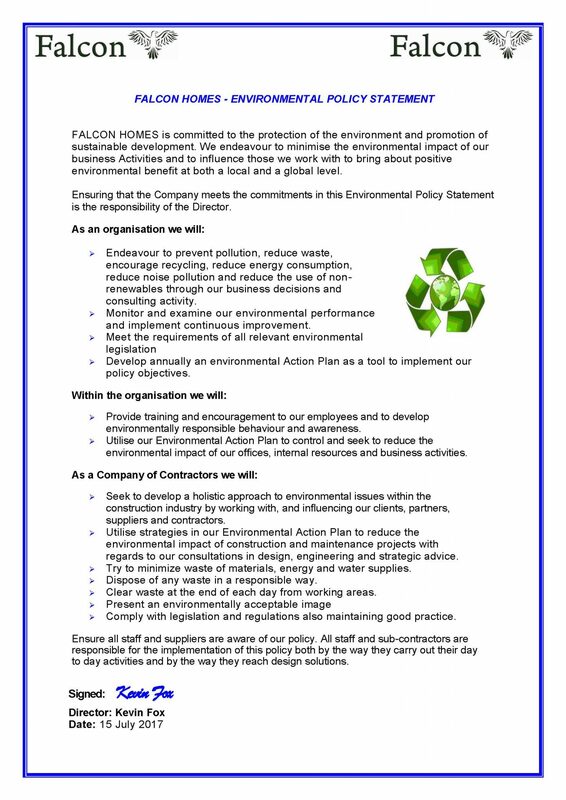 Falcon Homes Environmental Policy Statement. FALCON HOMES is committed to the protection of the environment and promotion of sustainable development. We endeavour to minimise the environmental impact of our business Activities and to influence those we work with to bring about positive environmental benefit at both a local and a global level. Ensuring that the Company meets the commitments in this Environmental Policy Statement is the responsibility of the Director. Develop annually an environmental Action Plan as a tool to implement our policy objectives. Provide training and encouragement to our employees and to develop environmentally responsible behaviour and awareness. Utilise our Environmental Action Plan to control and seek to reduce the environmental impact of our offices, internal resources and business activities. Seek to develop a holistic approach to environmental issues within the construction industry by working with, and influencing our clients, partners, suppliers and contractors. Utilise strategies in our Environmental Action Plan to reduce the environmental impact of construction and maintenance projects with regards to our consultations in design, engineering and strategic advice. Try to minimize waste of materials, energy and water supplies. Dispose of any waste in a responsible way. Clear waste at the end of each day from working areas. Comply with legislation and regulations also maintaining good practice. Ensure all staff and suppliers are aware of our policy. All staff and sub-contractors are responsible for the implementation of this policy both by the way they carry out their day to day activities and by the way they reach design solutions.